The debate "The role of CRISPR in Personalized Medicine: Legal and Ethical Problems" (FEBS Special Session on Science and Society) gathered almost 400 attendees in the Aula Magna of the Faculty of Law at the University of Malaga (Spain) on December 12th, 2017. This activity was sponsored by FEBS as a collaboration with SEBBM following a similar session at the 2017 FEBS Congress, and was included in the XV edition of the scientific dissemination program Encounters with Science, organized by Enrique Viguera, Ana Grande and José Lozano (professors of the University of Málaga, Spain). In recent years we have witnessed the emergence of one of the most powerful biotechnological tools that humans have had to date. The genetic editing technique CRISPR-Cas9, whose origin comes from the pioneering work of the Spanish microbiologist Francisco Mojica (1, 2, 3), puts in our hands the capacity to modify with great precision and efficiency the genome of any living being, and therefore also that of the human being. There is an atmosphere of enormous expectation around the CRISPR technology, but also of misgivings, fed both by the media and by voices that are not always well informed, which prompted the necessity for a multidisciplinary debate on the real possibilities of the application of editing genetic techniques, on its foreseeable benefits and on the dangers that it might contain. Among the invited speakers was Prof. Francisco Mojica himself from the University of Alicante (Spain), who detailed his discovery of the CRISPR repeated sequences, a name he himself proposed. Mojica identified that some of the "spacer" sequences flanked by CRISPR sequences were identical to fragments of bacteriophage and conjugative plasmids genomes, which led him to propose that these sequences would constitute a system of immunity acquired in bacteria and archaea that confers resistance against exogenous DNA. Surprisingly, the scientific community took many years to accept a discovery that is one of the greatest revolutions in the history of Biology. 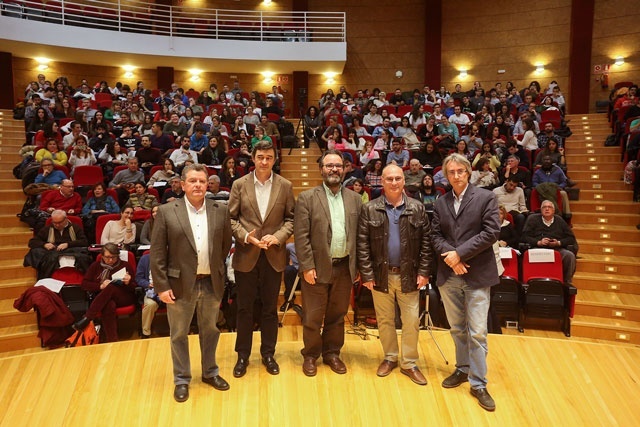 The researcher Lluis Montoliu (National Center for Biotechnology-CSIC, CIBERER-ISCIII) highlighted that the genetic editing tool based on CRISPR-Cas from a bacterial defense system is a magnificent example of how basic research ends up in applied research. The technology based on CRISPR-Cas9 allows us to reproduce in cellular and animal models certain human diseases such as congenital defects or rare diseases, like albinism, which is the genetic condition that is investigated in his laboratory. The CRISPR tools allow us to customize these models and build avatars – animal models that carry exactly the same genetic alteration diagnosed in patients. Moreover, according to Montoliu, these tools based on CRISPR represent a revolution in therapeutic strategies, with different gene therapy protocols validated in animal models, which are waiting to be authorized for use in patients. However, he stressed we must proceed with caution before transferring its use to people, taking into consideration the ethical and technical limitations of these tools. The development of tools that lead to the modification of the human genome opens hopeful ways for the cure of various diseases, but also opens more questionable ways to improve and enhance human traits, and even for the incorporation of completely new features; this was highlighted by Antonio Diéguez Lucena, Professor of Philosophy of Science at the University of Malaga. Should the future use of these techniques be limited to therapeutic functions? There will undoubtedly be a rethinking of these issues of great importance, both from the ethical point of view as well as from the political and social point of view. We could not close this debate without having a legal expert discuss the regulation of genome editing in Spain. Professor of Law and Human Genome of the University of the Basque Country (Spain) Iñigo de Miguel Beriain broke down the three major normative documents that deal with regulating this subject in Spain: the Oviedo Convention, Law 14/2007 on biomedical research and the Penal Code. He highlighted the gap that exists between the needs of biological research and the legal regulations that govern it; these regulations are based on standards that were developed from a very different historical context.